Orford ness is one of our favourite places. We go there at least once a year, for a very long walk, a picnic, and chats. Even my youngest can manage to walk around the red and blue walk (not green though, it’s never been open when we’ve been there, we always time it wrong). What we like to do is get up really early and head out without breakfast, fantasising about what we’ll eat from the Pump Street Bakery, when we get there. The fact that such an amazing bakery exists in what is a tiny village in the middle of nowhere astounds and delights me. And makes me very jealous. I wish we had one where I live in Suffolk. This is a tiny bakery, that is crammed into an old house. There are very few seats. But it is glorious. Please don’t miss it if you venture anywhere near Orford (which is a very pretty village). We’ve sampled the Bear’s Claws, the doughnuts, the brownies, the Eccles cakes and the almond croissants so far. You have to try the Eccles cake to believe that currants can be held in a puff pastry and be a thing of eye-watering beauty. We have breakfast – cappuccinos (very good) with pastries dipped in them, perched on the benches outside. I want to try a gibassier next time I’m there. I’m afraid the pastries are so good, I completely forget to photograph them, so the picture above is a photo of my feet on Orford ness beach. Probably my favourite beach in the world. This entry was posted in Bread, Breakfast, Buns, Consumer, Suffolk and tagged almond croissants, bread, breakfast, croissants, doughnuts, Orford, Orford Ness, pastries, pump street bakery, Suffolk on August 8, 2015 by Annalisa Barbieri. Although I’ve been baking bread, by hand, for three and a bit years now, I had yet to crack the perfect baguette. Or indeed, any sort of baguette. I suspected – and I was correct – that you needed a couche cloth to make a sourdough baguette and after I got a couche cloth as part of my birthday presents (I’m not a girl who needs an underpaid worker to go into a mine and get me a diamond) I set to work. 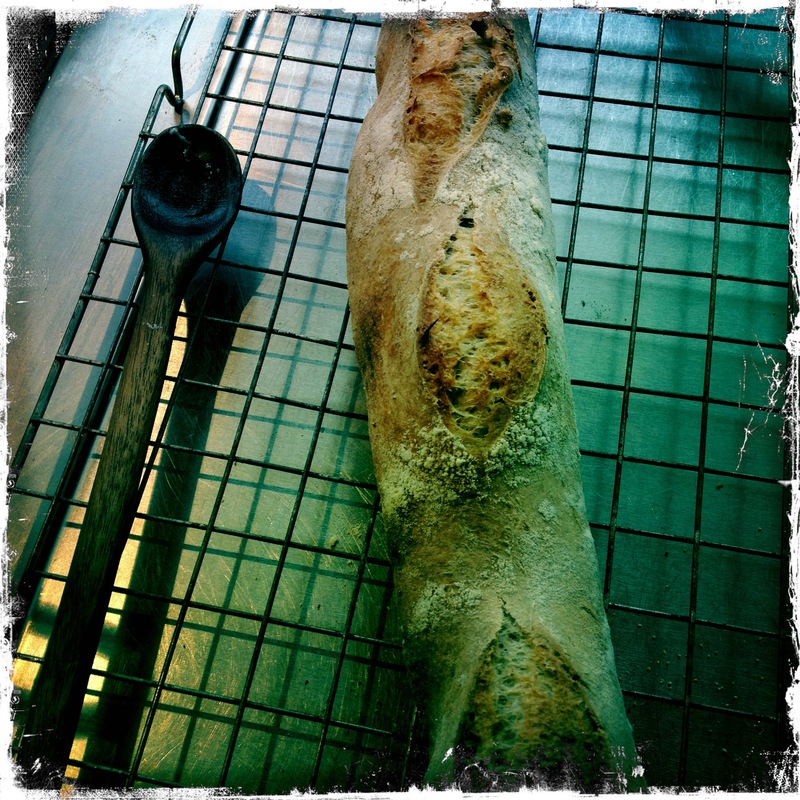 The first thing making baguettes taught me is that you really do need to nail your shaping. If you don’t properly prepare the dough for shaping (give it a final knead, then let it rest for about 20 mins before shaping it) it won’t shape so easily and if you don’t shape it properly, it won’t have the surface tension to hold its form. If it can’t hold its form properly then it will be hard to slash and if all those things happen you will get bread that is perfectly lovely and edible. But it won’t look good as it could be. 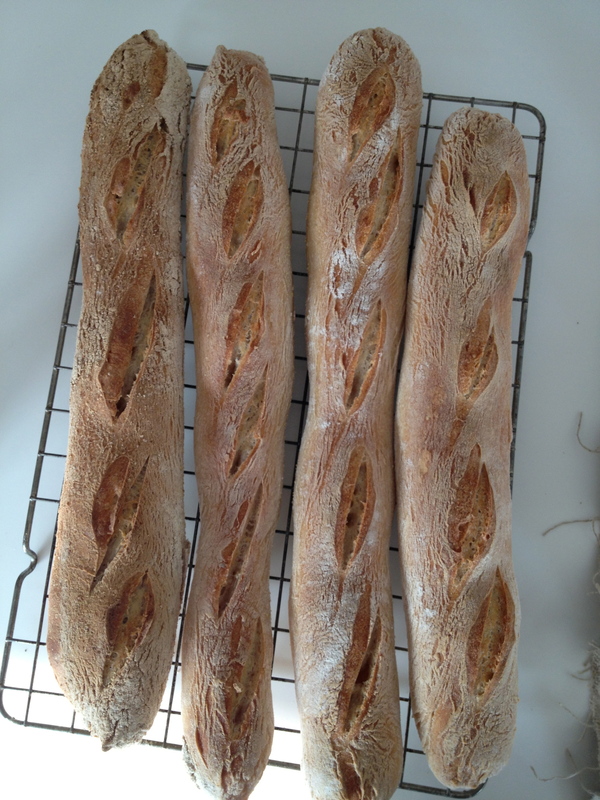 My first four baguettes, tasted great but shaping and slashing not great. Next two. Better but not there yet. Dan Lepard and the lovely Joanna from Zeb Bakes helped me with shaping and other tips. Joanna linked me to some shaping and slashing videos on line. Dan reminded me to put the bread into the hottest oven possible for the maximum amount of oven spring. Because I really do think a baguette has to be made of white flour, I don’t really attempt to make it too healthy. But I did have, what I thought was a master stroke of genius and (because I just really struggle with adding 100% white flour it seems so unhealthy) I added 50g-ish of rye to my 450g of white flour. Okay so it’s not much but it stops it being made completely from white flour. I say this is a master stroke of genius in this way because after I did this, I read that Dan also recommends doing this to add a bit of nuttiness and flavour to an otherwise white loaf. So, you know, I felt really very clever. Adding a bit of other flour doesn’t detract from the white-ness but it does add a certain something. I also find that sprinkling both the baking tin with polenta (so that it coats the bottom of the baguette), and the top of the baguette, lends even more certain somethingness. The other thing to note is that with baguettes, I’ve found I really do need my grignette. So I had to find it in the back of my drawer. The videos I link to above show you how to do the slashes, as they’re quite particular. I can’t use a bread knife slashing baguettes. Anyway. I’ve now got it so that I wouldn’t say I’ve perfected the art of the baguette, not by any means, but I’ve got it so that I can make a pretty good one which, with some butter and apricot jam and a bowl of caffe latte, makes a pretty perfect breakfast. A bit naughty, without descending into something so bad for you, you want to start slashing at yourself. Do look at the videos for shaping and practise. It’s really worth it. 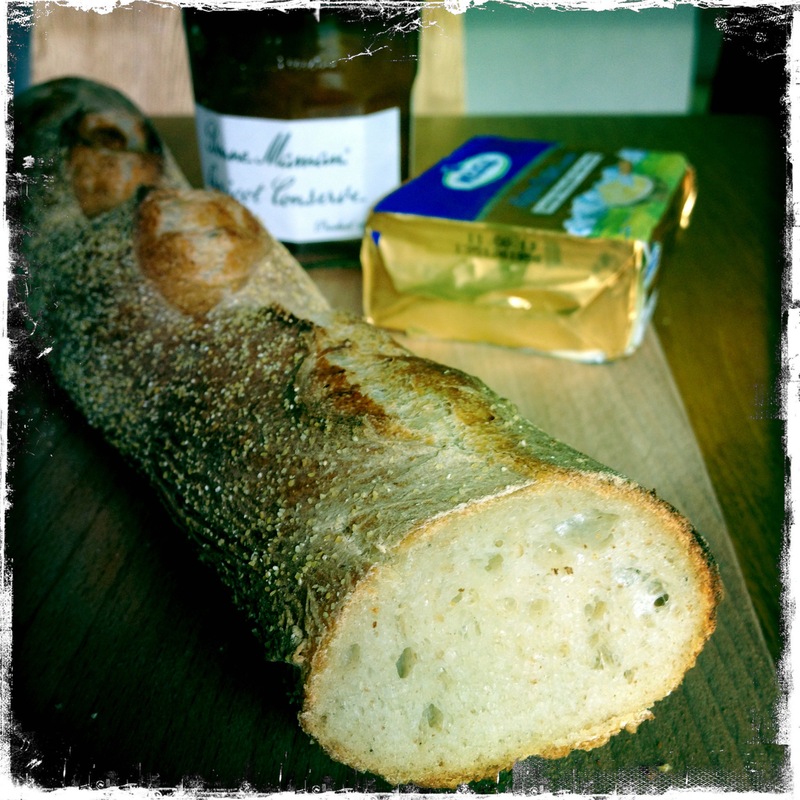 This entry was posted in Bread, Picnics, Sourdough and tagged baguettes, breakfast, French stick, grignette, shaping, slashing on September 2, 2013 by Annalisa Barbieri. All wrapped in a little cellophane bag with a chic black ribbon. A nice present to take to someone if you’re stuck for ideas. Granola is one of those things it’s so worth making yourself. The shop-bought stuff is either purse-clenchingly expensive or fairly full of dust-type ingredients. Or sometimes, both. 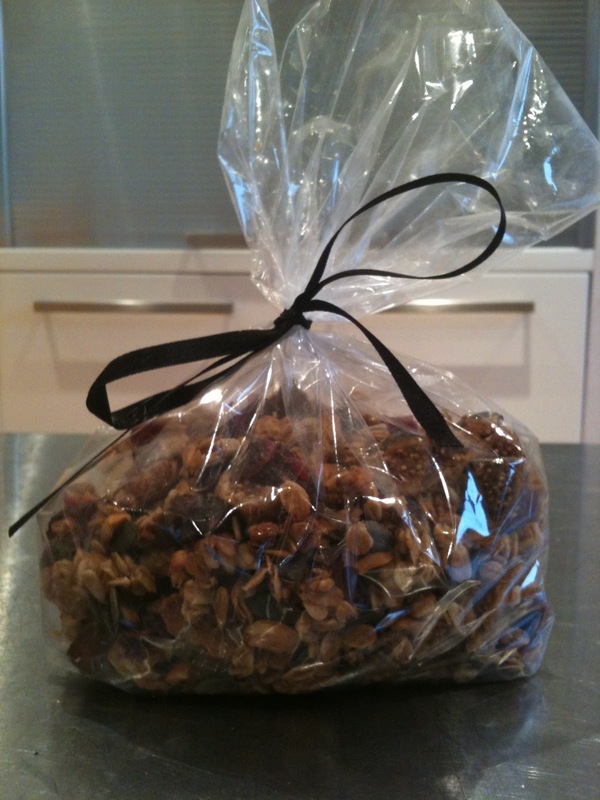 I first started making granola from a Nigella Lawson recipe. It was great. Then I started having babies and for the duration of my pregnancies, and about a year post-partum, all I wanted were two croissants and caffe latte (in a big bowl) for breakfast. Granola? Far too crunchy and munchy. Then I got the first Ottolenghi cookbook and made his granola. And all other granolas faded into memory. I’ve been meaning to put this recipe up since last year, but some how never managed it. But I went to lunch at my friend Mary’s house the other week, to discuss the Global Agenda for Women and Children 2011 (you mean you don’t discuss stuff like this at lunch?). And I thought, what on earth can I bring her? I’m of the mind you can’t turn up for lunch empty handed. I didn’t want to bring a loaf of sourdough, cos so many people don’t eat wheat these days. I wondered if she’d think me terribly gauche if I turned up with some granola. I’d just made it. I have some nice cellophane bags and lots of ribbon. I asked my partner what he thought. “What can I bring?” I lamented. “What about some granola?” he ventured. So I knew it was must be a good idea. When I got there I was so glad I’d brought it as Mary said she loved granola and then, a few days later, she emailed me to say it was the best ever and it had all gone already. Anyway, here is the recipe. The original recipe doesn’t call for linseeds, but as they are the highest vegetable source of omega 3s, I add ’em. I’m not always exact with the recipe. Sometimes I chuck more almonds in, or more brazils. You can tailor it to suit. But if you start really adding tons to the ‘dry stuff’ then it won’t be so gloriously crispy or tasty (because there won’t be so much wet stuff to coat it, of course you could just up that too, but I think if you play around with some things too much, you lose the essence of it), so don’t go crazy. 120g dried fruit – Ottolenghi originally asks for 60/60 of dried cranberries and blueberries, I use those and/or figs or raisins etc. Use your imagination and also what’s on offer. Preheat the oven to 140C. You’ll need two baking sheets lined with baking parchment. Roughly chop the nuts and put them in a bowl. This is the hardest, for me, part of the recipe. I HATE HATE HATE chopping nuts. But don’t be tempted to do this in a food processor cos you’ll end up with tiny bits of nuts. And that’s really not what you want. When my mum is visiting, I ask her to do it for me and she’s great at it – you can tell she was a professional cook because she chops them evenly. I get all frustrated at the nuts richocheting off the chopping board and end up with tiny chopped bits and huge bits. But I tell myself it adds to the character of the granola. To the nuts, add the seeds and the oats. Set to one side. This is the dry stuff. In a sauce pan, put all the wet ingredients and put over a low heat until everything has melted together. You just need to heat things up gently. Pour the wet stuff over the dry stuff (DON’T ADD THE AFTER STUFF YET! THAT’S FOR AFTERS). Mix with a wooden spoon until everything is nicely coated and then divide up over the two trays. Don’t spread too thick a layer or the granola won’t crisp up. I put one on the top tray of the oven (don’t use a fan oven, just a regular oven is fine) and one on the bottom. It takes about 40 mins to be ready – the granola should be golden brown. Obviously the top tray is done quicker, so when that’s done put the bottom tray on the top shelf and give it like another 20 mins or so. Then you just mix the cooked dry stuff with the after stuff. The granola will crisp up as it cools. Wait for it to be absolutely cool, then put in an air tight container. It keeps for weeks but it won’t last that long. You can eat it as it is – like a snack. You can eat it just with yoghurt. I eat mine, of a morning, with a dollop of live yoghurt, a handful of fresh blueberries/fruit and some organic semi skimmed milk. I still drink a giant bowl of caffe latte too, since some habits die hard. 2016 update: I have smidged the recipe around a bit but it’s still very true to the original and, I think, still the best granola you can make. 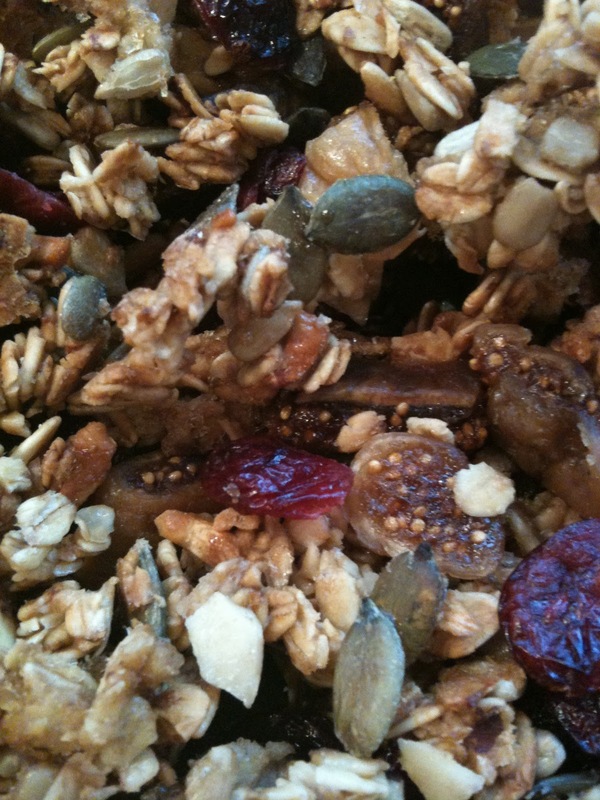 This entry was posted in Breakfast and tagged breakfast, granola, oats on February 14, 2011 by Annalisa Barbieri.